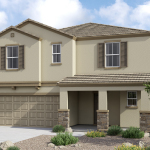 GLENDALE, Ariz.--(BUSINESS WIRE)--KB Home (NYSE: KBH) today announced the grand opening of Marbella Ranch, its latest collection of new single-family homes in the Phoenix area. Located near the heart of Glendale and just minutes from Westgate Entertainment District and Luke Air Force Base, Marbella Ranch is convenient to Loop 303, Loop 101 and Interstate 10. Marbella Ranch will feature several community amenities, including a play structure, shade structure, picnic tables and benches, and is also near several recreational facilities. 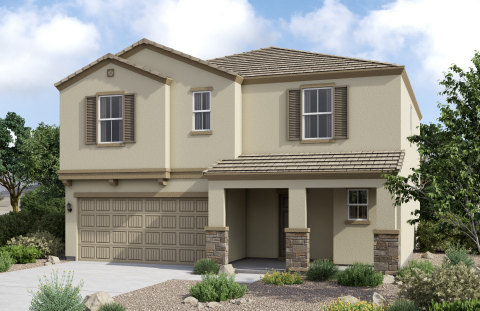 KB homebuyers can enjoy their free time at several area golf courses, the Wildlife World Zoo, Aquarium & Safari Park, and Dust Devil Park, which includes a playground, splash pad, skate plaza and basketball court. At nearby White Tank Mountain Regional Park, visitors can explore nearly 30,000 acres of mountain and desert landscape via hiking, biking and equestrian trails. Sports fans can take in the action at Camelback Ranch, the spring training home of the Los Angeles Dodgers® and the Chicago White Sox®, cheer on the Arizona Cardinals® at State Farm Stadium or watch the Coyotes® at Gila River Arena. Prime shopping, dining and entertainment is available at nearby Westgate Entertainment District, and residents can try their luck at Desert Diamond Casino. KB Home will host a grand opening celebration at Marbella Ranch on Friday, Nov. 30 10 a.m.–6 p.m., during which attendees may tour the three elegantly appointed model homes. In total, KB Home will be constructing 84 one- and two-story homes, offered in six distinct floor plans. With up to five bedrooms and three baths and ranging in size from 1,500 to 2,500 square feet, the KB homes at Marbella Ranch also feature desirable design characteristics like open floor plans, lofts and spacious walk-in closets. Pricing begins in the low-$200,000s. The KB homes at Marbella Ranch will be built to current ENERGY STAR® certification guidelines and include WaterSense® labeled faucets and fixtures, meaning they are designed to be more energy and water efficient than most typical new and resale homes available in the area. These energy- and water-saving features are estimated to save homebuyers between $1,416 and $1,788 a year in utility costs, depending on floor plan. KB Home’s distinct homebuilding process allows buyers to personalize many aspects of their new home to suit their budget and preferences. After selecting their homesite and floor plan, KB homebuyers can work with expert design consultants, who can guide them through every aspect of the process at KB Home Design Studio, a retail-like showroom where they may select from a plethora of design choices, including countertops, cabinets, lighting, appliances and window coverings. The Marbella Ranch sales office is located at the intersection of N. El Mirage Rd. and W. Glendale Ave. From I-10 West, take Exit 7B/Hwy. 101 Loop North. Exit W. Glendale Ave. and turn left. Continue for approximately 3.5 miles to the community on the right. The sales office is open Mondays, 2–6 p.m., and Tuesdays through Sundays, 10 a.m.–6 p.m. For more information about Marbella Ranch or KB Home’s other new-home neighborhoods, visit www.kbhome.com or call 888-KB-HOMES. KB Home (NYSE: KBH) is one of the largest homebuilders in the United States, with more than 600,000 homes delivered since our founding in 1957. We operate in 36 markets in eight states, primarily serving first-time and first move-up homebuyers, as well as active adults. We are differentiated in offering customers the ability to personalize what they value most in their home, from choosing their lot, floor plan, and exterior, to selecting design and décor choices in our KB Home Studios. In addition, our industry leadership in sustainability helps to lower the cost of homeownership for our buyers compared to a typical resale home. We take a broad approach to sustainability, encompassing energy efficiency, water conservation, healthier indoor environments, smart home capabilities and waste reduction. KB Home is the first national builder to have earned awards under all of the U.S. EPA’s homebuilder programs — ENERGY STAR®, WaterSense® and Indoor airPLUS®. We invite you to learn more about KB Home by visiting www.kbhome.com, calling 888-KB-HOMES, or connecting with us on Facebook.com/KBHome or Twitter.com/KBHome .